Was going thru the JavaFX 1.2 API and found a lot of new features some of them are: New JavaFX Controls, New Layouts, Charting API, Local Data Storage among others. I was impressed by few samples which i saw here and here. 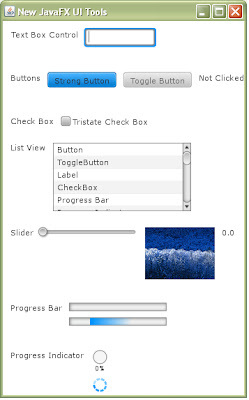 So i thought of exploring the New JavaFX Controls and created a sample application. Run the JNLP file here. Will try out the Chart API as well!!! !